Marco Palinar is an accomplished Web and Graphic Designer currently specializing in aesthetic, highly-functional and user-centric design solutions that scale. While he majored in Psychology and Political Science from the Philippines' premier state university - Marco discovered early on that his real passion was in art, resulting in his immersion into a career rooted in graphic and web design. And since 2004, he has been creating design solutions for various different companies where he has been employed or worked with in his freelance career. From creating scalable user interface design for social networking giant Friendster to redesigning/implementing the website of Philippine's top clothing retailer Penshoppe - his application of design and internet technologies are diverse and well rounded, while being rooted on web standards and best practices. At present Marco is concentrating on creating highly-usable and aesthetic design solutions, targeting web applications and user-centric websites and more recently has delved into delivering these interface designs solutions to mobile platforms. He is currently a freelance web designer working on several web start ups as Chief User Interface Designer. 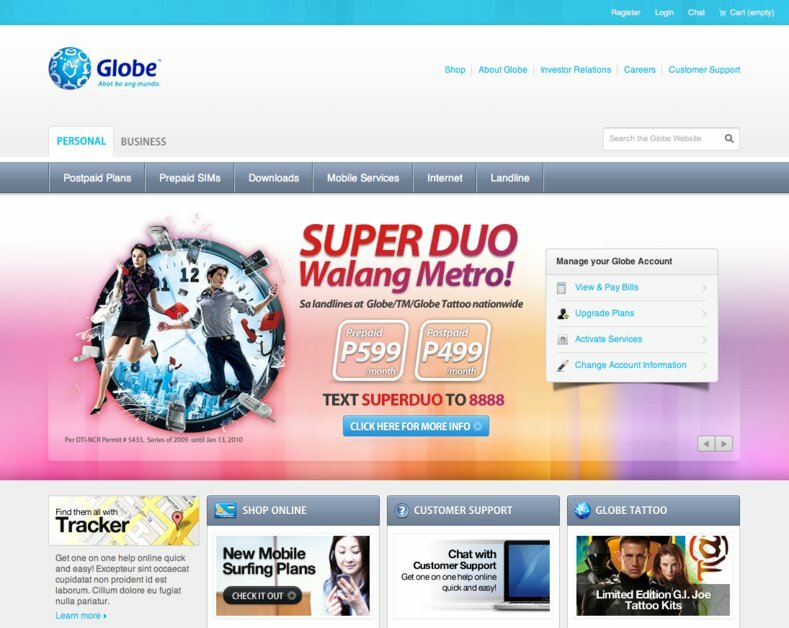 I basically did the redesign for Globe's new coroporate site. I focused a lot on a cleaner look and really crisp ui elements. XHTML strict (well at least my initial markup files were. java-based cms screwed it up) and I leveraged a lot of CSS3 stuff and 32-bit transparent images. The best thing about this project is that I got the client to totally screw IE6 over.